The National Highway Traffic Safety Administration (NHTSA, pronounced "NITS-uh") is an agency of the Executive Branch of the U.S. government, part of the Department of Transportation. It describes its mission as "Save lives, prevent injuries, reduce vehicle-related crashes." As part of its activities, NHTSA is charged with writing and enforcing Federal Motor Vehicle Safety Standards as well as regulations for motor vehicle theft resistance and fuel economy, as part of the Corporate Average Fuel Economy (CAFE) system. NHTSA also licenses vehicle manufacturers and importers, allows or blocks the import of vehicles and safety-regulated vehicle parts, administers the vehicle identification number (VIN) system, develops the anthropomorphic dummies used in safety testing, as well as the test protocols themselves, and provides vehicle insurance cost information. The agency has asserted preemptive regulatory authority over greenhouse gas emissions, but this has been disputed by such state regulatory agencies as the California Air Resources Board. Another of NHTSA's major activities is the creation and maintenance of the data files maintained by the National Center for Statistics and Analysis. In particular, the Fatality Analysis Reporting System (FARS), has become a resource for traffic safety research not only in the United States, but throughout the world. Research contributions using FARS by researchers from many countries appear in many non-U.S. technical publications, and provide a significant database and knowledge bank on the subject. Even with this database, conclusive analysis of crash causes often remains difficult and controversial, with experts debating the veracity and statistical validity of results. In 1964 and 1966, public pressure grew in the United States to increase the safety of cars, culminating with the publishing of Unsafe at Any Speed, by Ralph Nader, an activist lawyer, and "Accidental Death and Disability: The Neglected Disease of Modern Society" by the National Academy of Sciences. In 1966, Congress held a series of publicized hearings regarding highway safety, passed legislation to make installation of seat belts mandatory, and enacted Pub.L. 89–563, Pub.L. 89–564, and Pub.L. 89–670 which created the U.S. Department of Transportation on October 15, 1966. This legislation created several predecessor agencies which would eventually become NHTSA, including the National Traffic Safety Agency, the National Highway Safety Agency, and the National Highway Safety Bureau. Once the Federal Motor Vehicle Safety Standards (FMVSS) came into effect, vehicles not certified by the maker or importer as compliant with US safety standards were no longer legal to import into the United States. Congress established the NHTSA in 1970 with the Highway Safety Act of 1970 (Title II of Pub.L. 91–605, 84 Stat. 1713, enacted December 31, 1970, at 84 Stat. 1739). In 1972, the Motor Vehicle Information and Cost Savings Act (Pub.L. 92–513, 86 Stat. 947, enacted October 20, 1972) expanded NHTSA's scope to include consumer information programs. Since then, automobiles have become far better in protecting their occupants in vehicle impacts. The number of deaths on American highways hovers around 33,000 annually, a lower death rate per vehicle-mile traveled than in the 1960s. NHTSA has conducted numerous high-profile investigations of automotive safety issues, including the Audi 5000/60 Minutes affair, the Ford Explorer rollover problem and the Toyota: Sticky accelerator pedal problem. The agency has introduced a proposal to mandate Electronic Stability Control on all passenger vehicles by the 2012 model year. This technology was first brought to public attention in 1997, with the Swedish moose test. In 1958, under the auspices of the United Nations, a consortium called the Economic Commission for Europe had been established to commonize vehicle regulations across Europe so as to standardize best practices in vehicle design and equipment and minimize technical barriers to pan-European vehicle trade and traffic. This eventually became the World Forum for Harmonization of Vehicle Regulations, which began to promulgate what would eventually become the UN's ECE Regulations on vehicle design, construction, and safety performance. Many of the world's countries accept or require similar standards to the U.S. or ECE compliant vehicles. The U.S blocks the importation of vehicles that do not meet the higher U.S. standards, including those built to ECE Regulations. Because of the unavailability in America of certain vehicle models, a gray market arose in the late 1970s. This provided an alternate, legal method to acquire vehicles only sold overseas. The success of the gray market, however, ate into the business of Mercedes-Benz of North America Inc., which launched a successful congressional lobbying effort to eliminate this alternative for consumers in 1988, despite the lack of any evidence suggesting grey-market vehicles were less safe than those built to comply with U.S. regulations. As a result, it is no longer possible to import foreign vehicles into the United States as a personal import, with few exceptions—primarily Canadian cars with safety regulations substantially similar to the United States, and vehicles imported temporarily for display or research purposes. In practice the gray market involved a few thousand luxury cars annually, before its virtual elimination in 1988. In 1998, NHTSA exempted vehicles older than 25 years from the rules it administers, since these are presumed to be collector vehicles. In 1999, certain very low production volume specialist vehicles were also exempt for "Show and Display" purposes. However, the ban on newer vehicles considered safe in countries with lower vehicle-related death rates has led some to claim that the main effect of NHTSA's regulatory activity is to protect the U.S. market for a modified oligopoly consisting of the three U.S.-based automakers and the American operations of foreign-brand producers. It has been suggested that the impetus for NHTSA's seeming preoccupation with market control rather than vehicular safety performance is a result of overt market protections such as tariffs and local-content laws having become politically unpopular due to the increasing popularity of free trade. This has driven U.S. industry to adopt less visible forms of trade restrictions in the form of technical regulations different but demonstrably not superior to those outside the United States. An example of the market-control effects of NHTSA's regulatory protocol is found in the agency's 1974 banning of the Citroën SM automobile, which contemporary journalists noted was one of the safest vehicles available at the time. NHTSA disapproved the SM due to its high-performance, low-glare, steerable headlamps which were not of the outmoded sealed beam design mandatory in the U.S., and its height adjustable suspension, which made compliance with the 1973 bumper requirements impossible; the bumper regulation was intended to control the costs resulting from low speed collisions, not enhance occupant safety. In the mid-1960s when the framework was established for US vehicle safety regulations, the US auto market was an oligopoly, with just three companies (GM, Ford, and Chrysler) controlling 85% of the market. The Federal Motor Vehicle Safety Standards are contained in the United States Code of Federal Regulations, Title 49, Part 571. This is commonly referred to as 49CFR571, with any particular FMVSS appended after a period, as for example 49CFR571.301—the location of FMVSS 301. Additional federal vehicle standards are contained elsewhere in the CFR. For instance, 49CFR564 contains the specifications and requirements for the various types of replaceable headlamp "light source" (bulb). FMVSS 209 was the first standard to become effective on March 1, 1967. A system of auto safety performance and equipment regulations (ECE Regulations) has been in place in Europe since 1958. Many countries have since been adopted regulations similar to those of the U.S. or ECE. Vehicles sold in the U.S. are required to meet higher U.S. standards. The North American auto market includes most of the world's major automakers and is the world's most profitable for automakers. American vehicle equipment and construction regulations are based on the rigorous Society of Automotive Engineers (SAE) standards. Research on the trends in use of heavy vehicles indicate that a significant difference between the U.S. and other countries is the relatively high prevalence of pickup trucks and SUVs in the U.S. A 2003 study by the U.S. Transportation Research Board found that SUVs and pickup trucks are significantly less safe than passenger cars. Comparisons of past data with the present in the U.S. can result in distortions, due to a significant population increase and since the level of large commercial truck traffic has substantially increased from the 1960s while highway capacity has not kept pace with the increase in large commercial truck traffic on U.S. highways. However, other factors exert significant influence; Canada has lower roadway death and injury rates despite a vehicle mix comparable to that of the U.S. Nevertheless, the widespread use of truck-based vehicles as passenger carriers is correlated with roadway deaths and injuries not only directly by dint of vehicular safety performance per se, but also indirectly through the relatively low fuel costs that facilitate the use of such vehicles in North America. Motor vehicle fatalities decline as gasoline prices increase. NHTSA has issued few regulations in the past 25 years. Most of the reduction in vehicle fatality rates during the last third of the 20th century were gained from the initial NHTSA safety standards during 1968–1984 and subsequent voluntary changes in vehicle crashworthiness by vehicle manufacturers. NHTSA created a Standardized Field Sobriety Testing (SFST) training curriculum to prepare police officers and other qualified persons to conduct the SFST’s for use in DWI investigations. This training was developed in combination with the International Association of Chiefs of Police (IACP), and has experienced remarkable success since its inception in the early 1980s. Since the 1980s, NHTSA began using required cost–benefit analysis for every safety device, system, or design feature mandated for installation on vehicles. That is, the device, system, or design feature may not be mandated unless it will save more money (in property damage, health care, etc.) than it costs, or must cost no more than a specified amount of money per life saved. Requirements are balanced through estimated costs and estimated benefits to justify or reject regulation; FMVSS #208 effectively mandates the installation of frontal airbags in all new vehicles in the United States, for it is written such that no other technology can meet the stipulated requirements. It has been argued that even using conservative cost figures and optimistic benefit figures, airbags' cost–benefit ratio so extreme that it may fall outside of the cost–benefit requirements for mandatory safety devices. Cost–benefit requirements have been used as the basis for lighting-related regulation in the U.S; for example, while many countries in the world since at least the early 1970s have required rear turn signals to emit amber light so they might be distinguished from adjacent red brake lamps, U.S. regulations permit rear turn signals to emit red light on grounds of cost-effectiveness and reasonableness, while NHTSA research showed amber rear turn signals may provide additional crash-avoidance benefit, NHTSA opted to require the center high mounted 3rd brake light to achieve safety goals. Vehicle manufacturers face considerable expense to certify a vehicle for U.S. sale, where they make considerable profits. Automotive News cited a 2013 model vehicle where this modification cost US$ 42 million. This cost is separate from costs incurred in other markets around the world. UNECE looks at the costs of Automobile safety standards in other markets around the world. NHTSA also administers the Corporate Average Fuel Economy (CAFE), which is intended to incentivize the production of fuel-efficient vehicles by dint of fuel economy requirements measured against the sales-weighted harmonic average of each manufacturer's range of vehicles. Many governments outside North America regulate fuel economy by heavily taxing motor fuel and/or by including a vehicle's engine size or fuel economy in calculating vehicle registration taxes (road tax). It is argued that such regulations are not politically feasible, and that doing so would hurt the struggling U.S. auto industry. Another putative problem with CAFE is that fuel economy is negatively correlated to vehicle weight—lighter vehicles giving better fuel economy—while vehicle weight is positively correlated to safety—larger and heavier vehicles better protect their occupants. Thus, NHTSA must accomplish two potentially contradictory regulatory goals at the same time. However, Transportation Research Board studies show safety disparities may exist among vehicles of differing price, country of origin, and quality not just among vehicles of different size and weight alone. Some other researchers dispute the incompatibility of reduction in vehicle weight and increased fuel economy. * Subject to revision due to alleged diesel engines emissions violations. Automakers faced an inherent conflict between NHTSA's stringent headlight legislation, which mandated unaerodynamic sealed-beam headlights, and the Corporate Average Fuel Economy standard, which effectively mandated that automakers develop ways to improve the ability of the car to cleave the air. As a result, in the early 1980s, automakers lobbied for a modification of the mandate for fixed shape sealed-beam headlamps. NHTSA adopted Ford's proposal for low-cost aerodynamic headlamps with polycarbonate lenses and transverse-filament bulbs. The minimum allowed performance and materials durability requirements of this new headlamp system are lower than those of the previous sealed beam system. For the 1984 model year, Ford introduced the Lincoln Mark VII, the first car since 1939 to be sold in the U.S. market with architectural headlamps as part of its aerodynamic design. These composite headlamps, when new to the American market, were commonly but improperly referred to as "Euro" headlamps, since aerodynamic headlamps were already common in Europe. Though conceptually similar to European headlamps with nonstandardized shape and replaceable-bulb construction, these headlamps conform to the SAE headlamp design standards contained in U.S. Federal Motor Vehicle Safety Standard 108, and not to the international safety standards used worldwide outside North America. In 1979, NHTSA created the New Car Assessment Program (NCAP) in response to Title II of the Motor Vehicle Information and Cost Savings Act of 1972, to encourage manufacturers to build safer vehicles and consumers to buy them. Since that time, the agency has improved the program by adding rating programs, facilitating access to test results, and revising the format of the information to make it easier for consumers to understand. NHTSA asserts the program has influenced manufacturers to build vehicles that consistently achieve high ratings. The first standardized 35 mph front crash test was May 21, 1979, and the first results were released October 15 that year. The agency established a frontal impact test protocol based on Federal Motor Vehicle Safety Standard 208 ("Occupant Crash Protection"), except that the frontal 4 NCAP test is conducted at 35 mph (56 km/h), rather than 30 mph (48 km/h) as required by FMVSS No. 208. More recently, in an effort to improve the dissemination of NCAP ratings and as a result of the Safe, Accountable, Flexible, Efficient Transportation Equity Act: A Legacy for Users (SAFETEA–LU) the agency has issued a Final Rule requiring manufacturers to place NCAP star ratings on the Monroney sticker (automobile price sticker). The rule has a September 1, 2007 compliance date. The agency has an annual budget of $815 million (2007). The agency classifies most of its spending under the driver safety heading, with a minority spent on vehicle safety, and a smaller amount on environmental matters of which it is in charge, i.e., vehicular fuel economy. ^ "Who We Are and What We Do". National Highway Traffic Safety Administration. Retrieved November 1, 2015. ^ "National Highway Traffic Safety Administration". International Trade Data System. Retrieved November 1, 2015. ^ "THIS IS NHTSA" (PDF). National Highway Traffic Safety Administration. Retrieved November 1, 2015. ^ a b "Budget Estimates, Fiscal Year 2018". National Highway Traffic Safety Administration. United States Department of Transportation. ^ "Budget Estimates Fiscal Year 2016 National Highway Traffic Safety Administration" (PDF). U.S. Department of Transportation. Retrieved November 1, 2015. ^ a b amy.lee.ctr@dot.gov (27 July 2017). "NHTSA Leadership". NHTSA. ^ Calmes, Jackie (5 April 2014). "Minding the Minders of G.M." – via NYTimes.com. ^ "Home | National Highway Traffic Safety Administration (NHTSA) | U.S. Department of Transportation". Nhtsa.dot.gov. Retrieved 2011-11-13. ^ a b Wochinger, Kathryn; Compton, Richard; Berning, Amy (2015). Results of the 2013–2014 National Roadside Survey of Alcohol and Drug Use by Drivers (US Traffic Safety Facts Research Note, Report No. DOT HS No 812 118). National Highway Traffic Safety Administration. p. 575. Retrieved 5 December 2018. ^ "NHTSA Budget Highlights FY2015" (PDF). NHTSA. 2014. ^ a b "What you need to know to avoid seeing your grey market car get crushed". Digital Trends. 30 August 2013. Retrieved 30 May 2015. ^ "How To: Win the Car-Importing Game". Retrieved 30 May 2015. ^ "Car Show Classic: 1985 Citroen CX 25 GTi Series 2 – Blue Is A Warmer Color Than Grey". Curbside Classic. Retrieved 30 May 2015. ^ M. E. Wenners; J. M. Frusti; J. S. Ninomiya (1998). "Global Regulatory Harmonization—One American Manufacturer's Perspective". Ref # 982266. Society of Automotive Engineers. ^ "Top 5: Citroen SM innovations that saw the future video - CNET". CNET. CBS Interactive. Retrieved 30 May 2015. ^ "Carpe Diem". Retrieved 30 May 2015. ^ Wenzel, T.; Ross, M. (2003). "Are SUVs Safer than Cars? An Analysis of Risk by Vehicle Type and Model" (PDF). Transportation Research Board. Retrieved 2008-03-09. ^ Federal Highway Administration (2006). "Chapter 14 Freight Transportation". United States Department of Transportation. ^ L.S. Robertson (2006). "Motor Vehicle Deaths: Failed Policy Analysis and Neglected Policy". Journal of Public Health Policy. 27 (2): 182–189. doi:10.1057/palgrave.jphp.3200074. ^ Evans, Leonard (2004). Traffic Safety. Science Serving Society. ISBN 978-0-9754871-0-5. ^ D.C. Grabowski; M.A. Morrissey (2004). 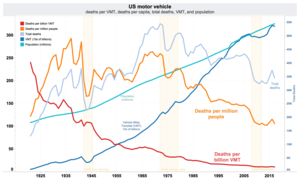 "Gasoline Prices and Motor Vehicle Fatalities". Journal of Policy Analysis and Management. 23 (3): 575–593. doi:10.1002/pam.20028. ^ L. S. Robertson (2007). Injury Epidemiology (Third ed.). Oxford University Press. pp. 186–194. ISBN 978-0-19-506956-3. ^ "Data-Driven Approaches to Crime and Traffic Safety (DDACTS) - National Highway Traffic Safety Administration (NHTSA)". one.nhtsa.gov. ^ "Data-Driven Approaches to Crime and Traffic Safety". National Institute of Justice. ^ Kocieniewski, David (29 November 2000). "New Jersey Argues That the U.S. Wrote the Book on Race Profiling" – via NYTimes.com. ^ "John Graham Releases Results of Cost–Benefit Analysis of Air Bag Safety". Riskworld.com. 1997-03-25. Archived from the original on 2011-09-28. Retrieved 2011-11-13. ^ Thompson, Kimberly M.; Segui-Gomez, Maria; Graham, John D. (2002-10-03). "Risk Analysis, Volume 22 Issue 4 Page 803-811, August 2002". Risk Analysis. 22 (4): 803–811. doi:10.1111/0272-4332.00070. ^ Hitzemeyer, E.G. ; Wilde, H.; Ellenburger, D (1977). "What Color Should Rear Turn Signals Be?" (paper). Society of Automotive Engineers. ^ D'orleans, G. (1997). "World Harmonization and Procedures for Lighting and Signaling Products" (paper). Society of Automotive Engineers. ^ Allen, Kirk (2009). "The Effectiveness of Amber Rear Turn Signals for Reducing Rear Impacts, DOT HS 811 115" (PDF). National Highway Traffic Safety Administration. ^ Beene, Ryan (July 25, 2015). "Wiping out U.S.-EU rules disparities would yield big savings". Automotive News. Retrieved December 4, 2018. ^ Knollenberg, Joe. "Big3Defense.com". Archived from the original (Website) on October 5, 2007. Retrieved October 4, 2007. ^ Benton, Joe. "GM Exec Slams Higher Mileage Standards". Consumer Affairs. Archived from the original (Website) on October 5, 2007. Retrieved October 4, 2007. ^ "Automakers cool to Bush plans to cut gas consumption" (Website). Channel NewsAsia. 24 January 2007. Retrieved October 4, 2007. ^ Kahane, Charles (October 2003). "Vehicle Weight, Fatality Risk and Crash Compatibility of Model Year 1991–99 Passenger Cars and Light Trucks" (PDF). National Highway Traffic Safety Administration. Retrieved 2007-11-15. ^ Wenzel, Tom; Ross, Marc (2003-01-15). "Are SUVs Safer than Cars? An Analysis of Risk by Vehicle Type and Model" (PDF). Transportation Research Board: 17–21. Retrieved 2007-10-04. ^ Robertson, Leon S. (2006). "Blood and Oil: Vehicle Characteristics in Relation to Fatality Risk and Fuel Economy". American Journal of Public Health. 96 (11): 1906–1909. doi:10.2105/AJPH.2005.084061. PMC 1751827. ^ CAFE December 2014. National Highway Traffic Safety Administration, U.S. Department of Transportation. Accessed October 2015. ^ a b "The New Car Assessment Program Suggested Approaches for Future Program Enhancements" (PDF). National Highway Traffic Safety Administration. January 2007. Retrieved 2008-11-24. ^ NHTSA. "NHTSA Budget Overview FY 2006" (PDF). p. 4. Retrieved 2007-06-19. Kevin M. McDonald, "Shifting Out of Park: Moving Auto Safety from Recalls to Reason" (Lawyers & Judges Publishing, 2006). Evans, Leonard (2004). Traffic Safety. Science Serving Society. ISBN 978-0-9754871-0-5. Code of Federal Regulations, Title 49, Transportation. Office of the Federal Register National Archives and Records Administration. 2004. pp. 19–1263. ISBN 978-0-16-072891-4. "U.S. Appeals Court Orders New Fuel Economy Standards". Planet Ark. Regulations regarding vehicle importation into the U.S.